Well, I finally finished my 300th review for, appropriately enough, Akira Kurosawa’s Sanjuro.I know it’s not the best-written review I’ve ever put out, but I did the best I could. I’ve always found that it’s much harder to review movies that you really love than it is to critique films that you really hate. 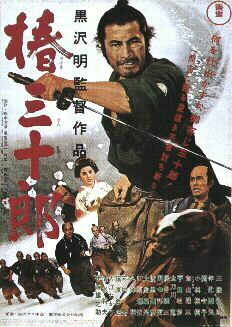 In fact, I had to write my review of the 2007 remake, Tsubaki Sanjuro, first (to be published later) to really get a handle on what I wanted to say about the original. Thankfully, I found the exhibit all by myself. It was hidden away in the lobby of the theater. For more information on Ekin Cheng’s visit to Singapore to unveil these props, click here. Sorry about the image quality! Since those pics aren’t exactly earth-shattering, I’ve embedded a link to a high quality version of the Storm Warriors Final Theatrical Trailer that was released a little while ago. Enjoy! I would say that the novel is every bit as gripping as the film is. The movie, of course, has the added advantage of actually terrifying you with disturbing onscreen imagery (which also leads viewers to have a better sense of what might unfold in a way that the book doesn’t). Less influenced by the dream logic that pervades the film adaptation, Murakami’s novel “makes sense” in an intellectual way — everything, bizarre or not, is understandable and explained quite clearly. Admittedly, that doesn’t make it better or worse than the film, but it certainly makes for a very different experience from the more symbolic, nightmarish landscape that envelops the 1999 film. Sparked by his teenage son’s encouragement, middle-aged widower and all-around swell guy Aoyama begins to look for a new wife. Upon the suggestion of his movie industry pal Yoshikawa, our hero agrees to take part in calling an audition for a new film, but with the ulterior motive of finding himself an “ideal woman.” Of the thirty young prospects, only one captures Aoyama’s interest - the beautiful, demure Asami. We’ve all seen enough She’s All That-inspired crap to guess what might happen next: the two lovebirds quickly fall for each other, but when Asami learns that the audition was a ruse, she dumps our protagonist. Naturally, Aoyama then spends the rest of the movie trying to win her back - which he does and the two marry. So in the end, Aoyama has a wife for himself and a mother for his son. Everybody’s happy. The end.Of course, that “educated guess” isn’t what happens AT ALL. The first 168-pages detail the budding romance between middle-aged Aoyama and the younger Asami, and the remaining 32-pages deal with the ghoulish conclusion of said relationship. I have to say that I did prefer the film’s inclusion of a “detective story” plot that does much to energize the last act, an element which is sadly not present at all in the novel. Still, the writing is great. Murakami’s characterization of the introspective Aoyama and his charming, all-too-wise teenage son, Shige, is reason enough to pick up the novel, that is– if you’re not too squeamish about horror. Further, the novel’s implicit commentary on patriarchy, sexism, and misogyny, not to mention it’s vivid exploration of the psychological toll of childhood trauma and abuse make this much more substantive than your average (Read: crappy) horror novel. And so, a word or warning: the 32-page finale, which begins with a character reminiscing about a sexual liaison in a way that may be WAAAAAY too explicit for casual readers, quickly turns into a dizzying, Grand Guignol-style ordeal that was almost as difficult to read as it was to watch in the chilling film adaptation. But if you can stomach it, Audition is still a damn good read.